This looks super-cool: a day-long retrospective of the films of Lee Breuer, including a showing of Dollhouse (for which I wrote the music) at 6:30 pm. Upcoming Events | The Films of Lee Breuer. Mabou Mines Dollhouse & Others. Check it out: we’ve posted a sizzle reel for Descent, our musical in development! Enjoy it! The Fresno State New Music Ensemble is presenting a concert of living Armenian composers in two performances (Fresno March 9 and Glendale March 28), including my piece Waiting for Billy Floyd. If you happen to be around, check out these fine young players in what looks like a really interesting program. I’m heading to Florida next week for a short residency at Polk State College. YAY, a few days of no snow!!!! Play Like a Girl in NYC! Play Like a Girl will receive its New York premiere on Sunday 8 February at the DiMenna Center. Salome Scheidegger will play three variations of the 8 factorial possibilities, and I can’t wait to hear her do it. I’m heading to San Francisco tomorrow where I will meet up with Giacomo Fiore and Mary Rowell to put together a bit of RiverProject music for the New Music Gathering, Thursday evening at 7 pm. really looking forward to seeing old and new friends! I am really honored to be given the 2015 Robert Rauschenberg Award from the Foundation for Contemporary Arts. To be recognized by the foundation set up by artists I love (John Cage, Merce Cunningham, and Jasper Johns, along with Rauschenberg) is more than a little amazing! 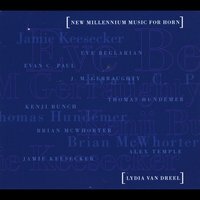 You can hear the premiere of No Delight in Sacrifice, a small piece responding to The Rite of Spring, at the above link. Bull Horn, Radio, Typewriter, Sandwich—Yes, It’s John Cage’s Birthday : Seen and Heard International. Bruce Hodges review of the Cage 102 show. John Cages “Song Books” – The New Yorker. A Monthly Series of New Music From Avant Media – NYTimes.com. 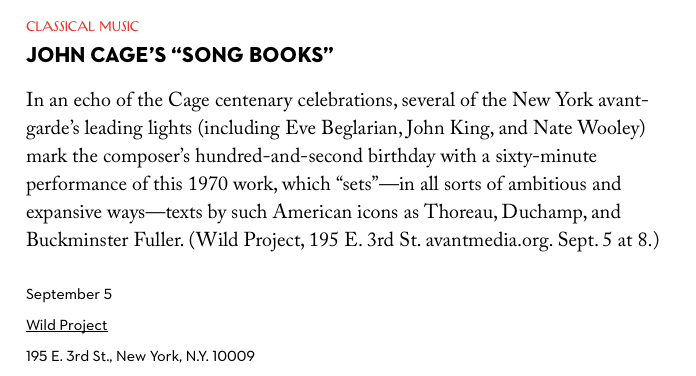 A commemoration of what would have been John Cage’s 102nd birthday will open the season, with a roster of new-music stars (among them Eve Beglarian, Vicky Chow, Nick Hallett, John King and Mr. Gibson) performing Cage’s 1970 “Song Books” (Sept. 5). Tony de Mare will be playing some of the Sondheim reworkings he’s commissioned on a concert in NYC on Sunday 12 May at 3 pm. It’s also being streamed, so you can check it out from wherever you are. My piece is a response to Happiness from Passion. It’s part of the WONDERFUL Tribeca New Music Festival: check out the whole series of concerts!